Unlike some rattlers, Pacific Rattlesnakes are active both by day and night--often coming out at dusk to hunt for prey. 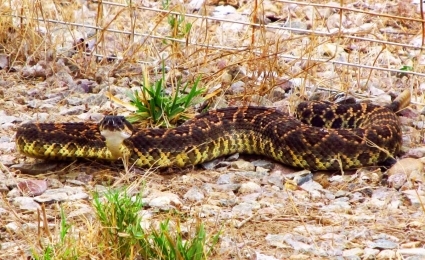 San Diego County is home to several varieties of rattlesnakes. Interestingly, the Mojave rattler has venom 44 times more potent than some other species. 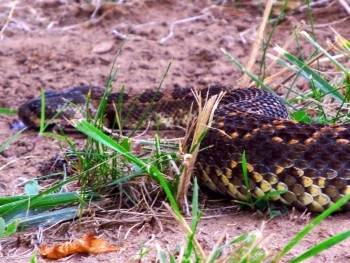 When hiking or working outdoors in the backcountry, be sure to wear sturdy shoes (preferably hiking boots) and never put hands or feet into brushy areas or rocks where you might startle a rattler. If you do spot a rattlesnake or hear the tell-tale rattle, freeze, then back up slowly--since fortunately most snakes just want to be left alone. You can learn many amazing facts about rattlesnakes in this amazing book about them, all online and free to read. Who knew that turkeys will surround a snake, cackle to warn you it's there, and even peck and kill a rattlesnake?